Fancy pants Cookies and Free e-book! On Monday I started working out again. Even on an incline and walking fast for 30 minutes isn't cutting it. It doesn't feel like a workout and at this stage of the game 30 minutes is all I can spend on a workout. On Monday night when I couldn't sleep I downloaded a running app and on Tuesday I started. It's been a looong time since I've ran. My body is in shock. Everything hurts, but in a good way. Last night I made the chocolate chip cookies that Tidy Mom posted about. They're from Jacque Torres and dubbed The Best Chocolate Chip Cookie Recipe. Ever. I won't lie, they're fussy cookies. I had to buy 2 different types of flour. I weighed my ingredients. And it gets better. The batter has to marinate for up to 3 days in the fridge. Trying to explain to Vaughn that we were making cookies but we can't eat the cookies until Sunday was tough. Here's my dough, chilling away. I may have screwed it up by not using fancy-pants chocolate chips though. It called for bittersweet chocolate, which I don't care for, and I forgot to buy fancy chocolate chips when I was shopping for all the fancy flours. We'll see how they do. I'll report back fo sho. Lastly, there's still time to squeeze in some Valentine's Day crafts. 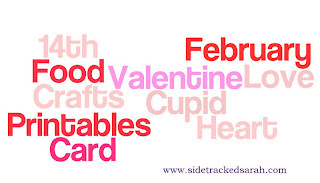 Sidetracked Sarah has put together a Valentine's Craft e-book that you should check out. It can be downloaded for free if you subscribe to her blog. My Heart Shaped Oreo Truffles are featured in it but there's so many other great ideas. Click on the picture for the link over there! It's Friday! And from what I hear there's some game that's being played on Sunday that I'm being forced to watch. Enjoy it! You love football! Marinating flour? Holy cow!